Maybe it has changed with time, or with the realisation that other things are important, but I have to admit to not always being comfortable about not being at the very top of the class. My younger self wasted too many tears when I didn’t achieve 100% in tests or when the grade was A- rather than A. Being “clever” has always been the basis of my identity and the most important aspect of my self-esteem. To the general bafflement of those closest to me I have spent only two of the last 21 years not studying for some university qualification or other but I think I am finally done. I literally cannot wait for this course to be over and mark the end of thirty-four years spent in the education system. As I come to the end of it I have been wondering what the future holds educationally for my children and what I would say if they didn’t want to go to university. For me, leaving home for university at 18 changed the course of my life in uncountable ways. Intellectually, politically, socially and culturally I flourished, distancing myself from a tricky family background and life on a “sink estate.” Doing an arts degree I had time and space to think and read, I made lifelong friends and learnt lessons about love that meant I knew enough about what not to put up with to enable me to see how downright wonderful Mr C was when he came along. My own children are having a childhood filled with love, stability and opportunity and they are great kids. Don’t get me wrong, they are also loud, infuriating, slightly spoilt and headstrong, but they are still pretty cool. They are away on holiday at the moment leaving me at home so I can get all “rose-tinted spectacles” about them. My daughter has inherited my affliction and “needs” to be at the top of the class. At age 8 she is far too aware of National Curriculum levels and targets and puts herself under too much pressure to be “perfect.” This is not helped by the fact that she has a pushy mother, but I am trying to learn and to give her the opportunity to “fail” at things and for us both to be happy about it. This is a work in progress (she stopped running when it became obvious she wasn’t going to win her race at Sports day) but I hope that when she gets older her self-esteem will be based on more than just being good at maths! She is funny and kind and beautiful and hard-working and she grabs hold of life, with a nature that says “yes” to the opportunities she gets. When I was first diagnosed, in the darkness of the early hours when it is more difficult to keep up the unrelenting positivity, the tears I shed were ones of fear for my children. I wanted them to have happy, “golden” childhoods, not ones marred by the need to be carers (I blame the films on TV charity appeals and a melodramatic nature for this.) Eighteen months on and those fears have largely dissipated – the good thing about them being so little is that they are essentially completely selfish and so are generally unaffected by things that don’t negatively affect them! When I was first ill and dizzy this did bother my son because he was still a fan of being carried and I couldn’t do that. Sometimes now when I say I can’t lift him he asks if it is the dizziness (it’s not, it’s the sheer size of him!) but otherwise they are pretty blase. They find my pins and needles mildly interesting, but not as interesting as watching “World’s Strongest Man;” they are generally unconcerned about my legs hurting so long as I can still make them their dinner and remember the stuff they need to do for school. Even during my last relapse it took my daughter about six weeks to notice that she was being ferried to her after-school activities by the parents of her friends rather than me. Not that we are hiding it from them – we are open about what I have and described it to them as “fluffy bits in my brain.” Last year my daughter, who is sport mad and became glued to the Olympic and paralympics, was delighted to see Stephanie Millward swimming on the TV. In fact she was so delighted she started telling people that I was going to Rio in four years and had good chats with one of her school friends whose dad is in a wheelchair and had represented Britain in Sydney about my medal chances! Her view of MS was thus resolutely positive and we congratulated ourselves on having managed to be open yet unscary and allow their lives to progress as normal … that is until about a month ago when she asked me when MS was going to kill me. She asked me this as we were rushing to school during a week when I had been able to walk them to school but had not been able to manage the walk home (we live on top of a hill.) 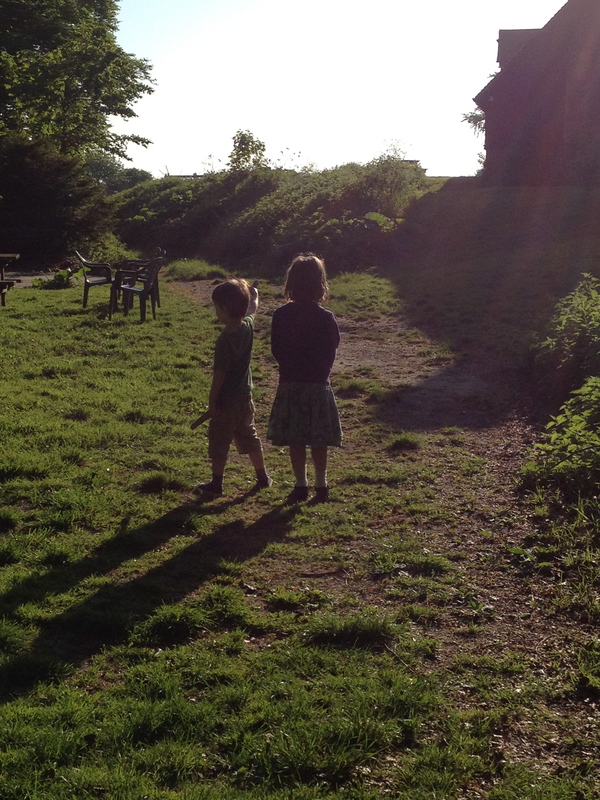 Still fully confident that the children hadn’t noticed anything the question floored me, as did the realisation that she had spent the last year worrying that I was getting more and more ill and that the inevitable consequence of that was that I was going to die. She had been waiting for the day when I told her I was better, as I had told her that M was “better” from her breast cancer, and because the day hadn’t come she had just filled in the gaps. So now we have to fill in the gaps and given that we don’t always understand it ourselves it is tricky. I went to see them at the seaside over the weekend and walked for a mile in each direction along the seafront which is the furthest I have walked in almost a year. Next week I take them to visit friends and family on the South coast and I hope I am really well so I can keep up with them, but I might not be and it is hard to explain why each day is different. I have been enjoying a blog recently where someone talked about refusing to let the MS be the thing that defines her here … our challenge now is to not let my MS be the thing that defines me or the childhood memories of my children. This entry was posted in Diagnosis, Parenting and tagged Multiple Sclerosis, Stephanie Millward, Stumbling in Flats. Bookmark the permalink.